Traditional apps are getting obsolete. 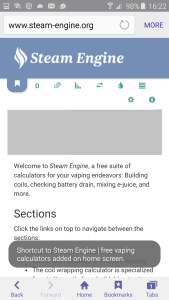 Now you can get an app-like experience of Steam Engine on your phone, in two easy steps, without installing anything at all. It takes less than one minute, literally. If you doubt it, check out the clock in the screenshots. The following instructions are for Android phones. If you want to do this on an iPhone, read through this guide (it’s pretty short), and then go here to see the corresponding steps for iOS devices. After you have navigated to http://www.steam-engine.org in the web browser, select More in the upper right corner of the screen. Yes, way up there, right next to the address line. You should see a menu opening. In the menu, tap Add shortcut on home screen. 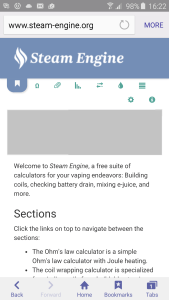 This puts the Steam Engine icon on the home screen of your phone, just like an app. Big and juicy, just waiting to be tapped. Not like one of those bookmarks that you hide away deep inside some obscure menu in the darkest corner of your phone, and promptly forget about for the rest of your phone’s life. Ok, so you may ask what’s so great about this. Well, now Steam Engine even works when you don’t have a connection to the Internet. In addition, it loads faster, takes up less bandwidth, and utilizes the whole screen. I’m considering to stop supporting the Android apps, because those are more or less obsolete by now. Yes, that’s how well this method works. It works on iPhone too. If you need the instructions for that, you can find them here. The new changes to the functionality also applies to most computer browsers. 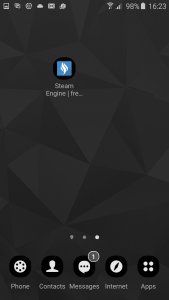 You can make a shortcut to Steam Engine on your desktop, and use the calculators even if your laptop or home computer loses Internet connectivity. I really think a fully functional Android app would be vastly more convenient. Opening a browser page every time I want to use the calculator isn’t an ideal solution! I really hope you reconsider this decision. Thanks for the comment, but I have to disagree with you on this. It is a fully functional Android (web) app, and you don’t have to open a browser page in any but the most technical sense of the word. How is using this icon any different from opening a native app, from a user’s point of view? Apart from the fact that it is easier to install than an app, I believe most users won’t even be able to tell the difference. Really wish you would update the app in Google play store. An app is much better then what you are suggesting. Not many people want to clutter their home screen. Just because Apple has a huge lack of customizability and makes the home screen 1 huge app drawer does not mean this should be forced on everyone. I was about to buy your app when I seen it was abandoned in favor of this method. Very poor choice in my opinion. You don’t have to add it to your home screen. If you store it as a regular bookmark, it will still work both online and offline. And if you don’t want to store it as a bookmark, you can type in the address whenever you want to use it. I like the web app. Very well done. Nice when I’m at the dining room table making new coils, don’t have to run across the house to calculate it. There are no “More” button on the top right corner. There are only shareware version on the Google Play Store (for Android mobile phones). The users must pay for the App. The menu can vary between devices. Are you using an iPhone? There’s a link in the blog post that takes you to a guide for iOS. It’s for a different site, but the procedure is the same. No, my friend. I use Samsung S4 Mini with Android. And I have various Internet browsers. Don’t worry I can use Steam Engine with my laptop very well. Hello, thanks for a great site. 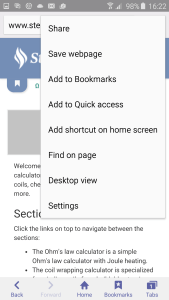 I am using Firefox on Android and I don’t have the ‘more’ button but if you open the Firefox menu, 3 dots, then ‘page’ you will find ‘add to home screen’. I hope this helps. Excellent article, many thanks for sharing vape fam. A big shoutout to all vapers from San Diego, California! If anybody happens to ever be there, make sure to pop into our vape store (South Coast Vaper Co.) for some amazing e-juice sampling and a warm and friendly chatter! Have an incredible day everyone and as always, keep your head in the clouds! I still be convinced that your decision to abandon the app development had been the worst you could take. Just now I was on play store searching for the app…. Very close to buy it when in screenshot I figured that it seems that the feature I mainly use, wire wizard, isn’t in the app. I need the calculator to work offline ’cause I live in an area with little to zero connection. Every time I check you pages nine from the office, save the results on an excel page to check it once at home…. I’ ve read the article on the offline use but I just see issues instead of solutions, and I don’ t want to try different browser, or test this or that way neither change this or that setting… Bla bla…. An app would simply be what we need. I don’t think to be wrong if I say that if you will restart to develop and support again your app with all the website features, you would sell many licenses at a reasonable price. Beside this, thanks for your great and useful work!